In general, gang-related crimes fall within the jurisdiction of state and local law enforcement. As gangs have spread across the country, and as their threat has become more national in nature, the interest in finding solutions to the problem has increasingly included all levels of government. The law enforcement community recognizes that gangs are violent and are responsible for a large percentage of criminal acts in their jurisdictions. Gangs are often involved in murders, assaults, auto theft, robbery, burglaries, dealing illegal drugs, prostitution, extortion, selling stolen goods, trading illegal weapons, human trafficking, vandalism through their tagging and violence against other gang members and occasionally citizens. Gang-related violence is very likely to remain at high levels as gangs expand their criminal operations into suburban and rural communities. As gangs encounter resistance from other local gangs or drug distributors in these communities, an increase in violent incidents such as assaults, drive-by shootings, and homicides can be expected. Neighborhood-based gangs account for the majority of gangs active in the United States; however, national gangs commit more organized criminal activity and continue to expand their networks. Neighborhood-based gangs will continue to consume the resources of local law enforcement in communities that report high levels of gang-related criminal activity, but migration of national gangs into new areas will pose an increasing threat to such communities. The traditional approach of the criminal justice system, focusing on the crime and not the criminal, is not effective in dealing with members of gangs. Therefore, it is the position of the law enforcement community to neither tolerate gangs nor their activity within their jurisdictions. All crimes committed by gangs or gang members should be investigated and when appropriate, charges should be filed. All contacts with suspected gang members or gang associates should be documented. Suspected gang related incidents or crimes that are reported as such need to be thoroughly investigated by the criminal justice system. 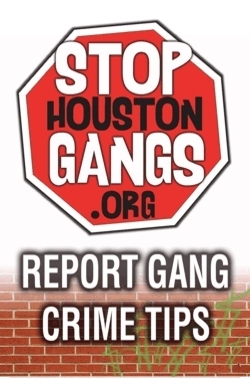 The Stop Houston Gangs Task Force is made up of street officers, investigators, instructors and support staff, all of whom were dedicated to eliminating or drastically reducing the gang and graffiti problem. It collects and reports information on all types of gangs and does not focus on any individual or gang solely because of ethnic or socioeconomic status. In response to increased gang activity, the Gang Task Force has created this website to keep Houston a safe place to live and work. The website allows residents to report anonymous tips and suspicious criminal gang activities in an effort to thwart the threat. Our Objective - To disrupt and dismantle the most significant and violent gangs in Houston and surrounding area. Involvement of local citizens, including former gang youth, community groups, and agencies, and the coordination of programs and staff functions within and across agencies. Involving youth-serving agencies, schools, grassroots groups, faith-based organizations, police, and other juvenile/criminal justice organizations in "reaching out" to gang-involved youth and their families and linking them with the conventional world and needed services. Formal and informal social control procedures, including close supervision and monitoring of gang-involved youth by agencies of the juvenile/criminal justice system and also by community-based agencies, schools, and grassroots groups.